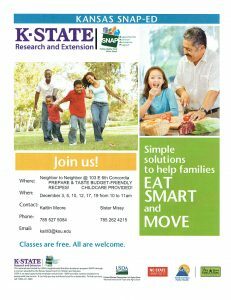 Kansas SNAP-Ed is offering a series of basic nutrition classes this December at Neighbor to Neighbor, 103 E. Sixth, Concordia. These classes are free of charge and all are welcome. Childcare is provided. Participants will taste-test a simple, budget-friendly recipe at each class. Participants will also receive a couple kitchen tools to help them be safer and better-prepared home cooks. Classes will be from 10 to 11 a.m. on Dec. 3, 5, 10, 12, 17 and 19. Neighbor to Neighbor is located at 103 E. Sixth St., Concordia. While the classes are free, please register in advance to make enough supplies are available.